Gareth Bale who had his first opportunity to take the lead in a one-on-one with the Eibar goalkeeper but was unable to get the shot away, and was booed by Real Madrid fans. He was also caught offside three times in the opening 15 minutes and further whistles ensued after the Welshman fired a long-range shot well wide of the target. 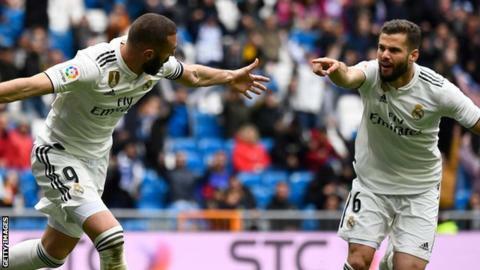 Moments later Benzema found the equaliser, heading home a Marco Asensio cross for his 16th league goal of the season. With less than 10 minutes left Benzema handed Madrid the lead with another header, but this time the cross was supplied by Toni Kroos. The Frenchman had two late chances to complete his hat-trick, missing an almost empty goal after substitute Lucas Vazquez squared the ball for Benzema rather than taking the shot himself.